Other major findings from the third and final data release from the tenth annual BDO Retail Compass Survey of CFOs. CHICAGO--(BUSINESS WIRE)--Retail CFOs believe the digital shopping revolution will continue in 2016. According to the tenth annual BDO Retail Compass Survey of CFOs by BDO USA, LLP, one of the nation’s leading accounting and consulting organizations, retail CFOs expect online sales to grow nearly 10 percent this year, and none expect to see a decline. Despite CFOs’ optimistic projections, however, they are focusing fewer dollars on building out their online presence following several years of ramped-up investment. Only 9 percent of CFOs say they will invest the most capital in their e-commerce channels, down from 22 percent last year. Mobile appears to remain somewhat of a priority, with 41 percent planning to increase their spending on mobile platforms—though this is a significant decline from last year, when 68 percent of CFOs planned to grow their spend. 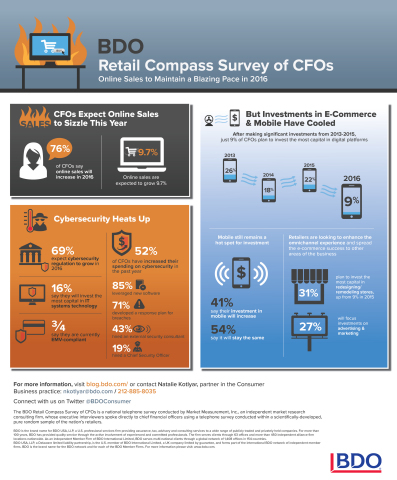 According to BDO USA's tenth annual Retail Compass Survey of CFOs, retail CFOs expect online sales to grow nearly 10% this year, and none expect a decline.